This guided tour begins with pickup at your Santa Barbara location, and kicks off with a drive up Santa Barbara’s bustling State Street. History is rich here and you will learn about the city’s architectural history as you head to the Santa Barbara Mission. At the old Mission, built in 1786, your guide will provide you with a historical overview of Santa Barbara’s past, including Chumash history, Spanish Colonization and the Mexican period. You’ll have the opportunity to visit the Mission museum and rose garden, and walk the front grounds as you desire. You will then continue to Santa Barbara’s wine country, about an hour away. Your guide will give you insights into the wine making industry of the region, and the locations featured in the movie Sideways, filmed throughout the area. 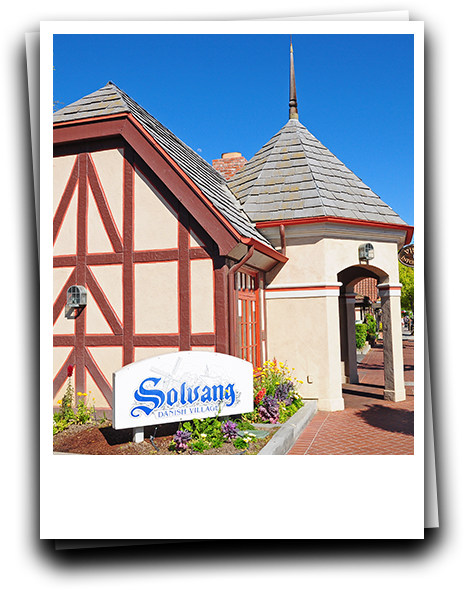 You will then be escorted to the heart of the quaint Danish-American town of Solvang, where for a few hours you can enjoy wonderful activities of your choice. In this charming village, built in the early 1900’s, you may seek out Danish pastries, farm-to-table food, shopping and wine tasting if you desire. You can even visit the Hans Christian Andersen museum, or rent a surrey to explore the village. This tour offers discounted and 2 for 1 wine tasting coupons for local wine tasting rooms which feature wines produced from the many bountiful vineyards throughout the valley. Next, the tour heads to a unique olive oil tasting on a small family farm in Santa Ynez, for an experience to remember. You will see where the olives are grown, and learn about how the farm produces the the many flavors of olive oil they create. The final stop before heading back to the city of Santa Barbara is the tiny village of Los Olivos, built during the stagecoach era, which is now home to boutiques, wine tasting rooms, bakeries, restaurants and galleries. Here you will see more important landmarks shown in the movie “Sideways”, and learn about the town’s history as a stagecoach stop. During your time in Los Olivos, where you will spend a little over an hour, you can seek out wine and cupcakes, check out the local art galleries or just find a beautiful oak tree to relax under. It’s your day! Following the visit to Los Olivos you will be driven back to Santa Barbara where you will be dropped off at the location of your choice. *Tour does not include any museum fees, food, or activity fees (such as wine tasting). Wine tasting discount coupons are dependent on tasting room availabilities on day of tour; while usually available these are not guaranteed.